Imagine if your next meal came with a side of altruism. That’s the opportunity sandwich chain Jersey Mike’s is offering customers today. In honor of their ninth annual Day of Giving, the company is donating all sales to charity. 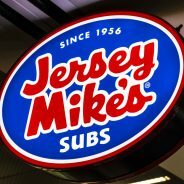 It is a nationwide event, meaning that every Jersey Mike’s location in the U.S. is participating. However, it’s only for today, so those who want to contribute had better grab a sub before they close. This single-day event is part of Jersey Mike’s “Month of Giving” campaign, in which customers are actively encouraged to support local charities. The campaign, which takes place every March, has raised $34 million since its initial launch in 2010. Cancro launched the sandwich shop in 1956—when he was just 17 years old. The east coast eatery quickly became popular, and now operates 1,537 shops in the U.S. Those who would like to support the company’s annual Day of Giving can find a nearby location by clicking here.